Biobanking core laboratories and biospecimen repositories are facing the demanding task to extract high-quality DNA and RNA for long-term storage from diverse sample materials like whole blood, buffy coats, and fresh, frozen or fixed tissues. 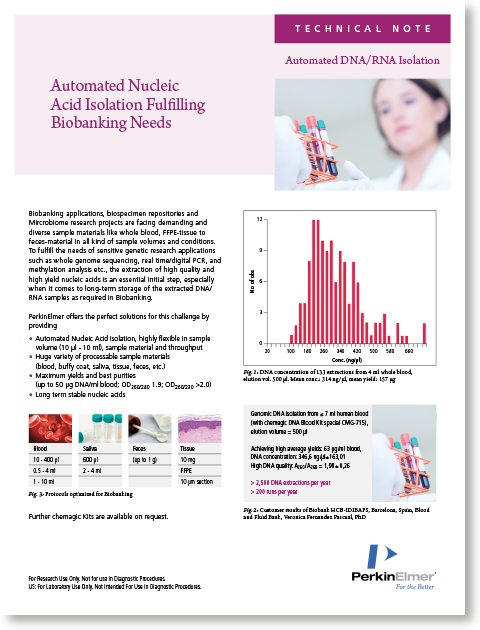 To fulfill the needs of sensitive genetic research applications such as whole genome sequencing, real-time and digital PCR, and methylation analysis, the extraction of high yields of ultra-pure nucleic acids is an essential initial step. The purity of nucleic acids is especially critical when it comes to long-term storage of the extracted DNA and RNA samples. PerkinElmer offers full workflow solutions optimized for biobanking and biorepository demands, including high-throughput DNA and RNA isolation solutions, liquid handling robotics, and nucleic acid quality control and analysis. With its exhaustive offering of instrumentations and kits, PerkinElmer is your single-source biobanking application support from nucleic acid extraction to data. Genomic DNA was isolated by the biobanking core lab at HCB-IDIBAPS in Barcelona, Spain. The initial sample volume was of 7 ml, and the DNA has been eluted in 500μl. 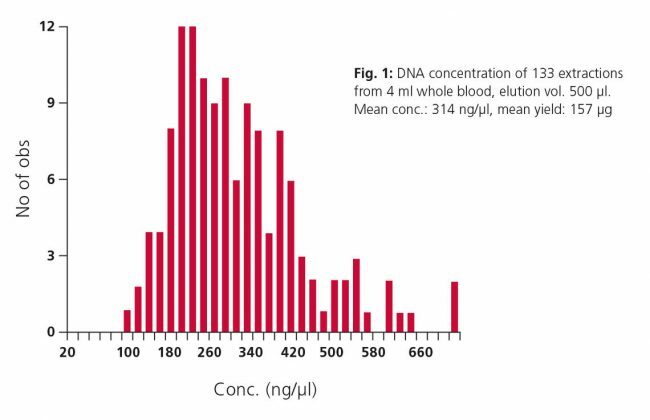 The average yield is 63μg per ml of blood, with a DNA concentration of 363 ng/μl ± 163. The typical DNA quality as measured by A260:280 is 1,98±0,26. PerkinElmer nucleic acid purification workflows, consisting in the combination of the chemagen's proprietary M-PVA Magnetic Beads and chemagic™ instruments, provide the reliable isolation of high yields of ultra-pure DNA and RNA. With a vast assortment of kits optimized for the extraction of nucleic acids from many different sample types, PerkinElmer DNA and RNA purification workflows are ideal for the needs of biobanking core laboratories. Please contact us to learn more.